A visit to Maine is always filled with joy and surprise for me. Last summer, after a visit to the museum in Rockland and a local art supply store, I was inspired to try my hand at visual journaling. 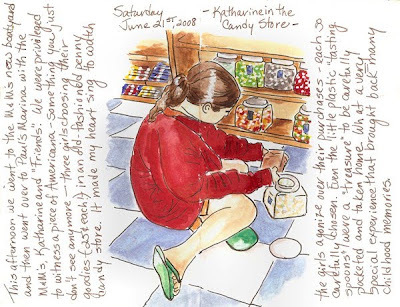 I sketched my granddaughter, Katharine, sitting on the floor of an old fashioned store, loading a paper bag full of penny candy. I was mesmerized by the simplicity, intensity and joy of that childhood moment. I'm not sure what I did right in a past life, but I sure got lucky in this one when The Fates introduced me to my husband. When asked what I wanted as a Birthday gift, my response was: "I want to see my grandkids." No sooner said than done - my wish has been granted! So here it is, the Monday before my Birthday, and we're on our way to Maine so that Conner (my grandson) and I can celebrate our "Mutual Birthdays" together on Wednesday!!! My heart is filled with happiness and the anticipation of hugs, laughter, kids and dogs. It promises to be a grand (and raucous) Birthday celebration! After spending time in Maine, we're heading to Nova Scotia - a first for us, and I can't wait. Since my access to the internet will be limited, I'll be taking a blog break and won't post anything new until we return in two weeks. I will, however, check in from time to time and will also pay a few visits. After all, I can't go through complete I-net withdrawal! Until then, stay well, be happy and make LOTS of art! 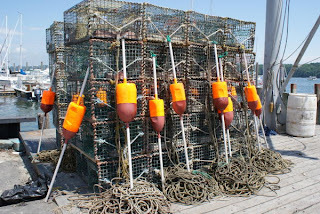 Watch out lobsters, here we come! 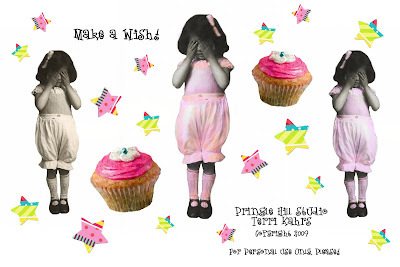 Cupcakes & A Celebratory Freebie! When I found this sweet image, I had no idea of making a collage sheet. However, since my grandson and I will be celebrating our mutual Birthdays this Wednesday, the 23rd, I thought I'd begin the celebration and share a cupcake (or two!) with you, my lovely friends and visitors! My Birthday girl looks like she's waiting for a wonderful surprise, so give her a pair of colorful wings and a Birthday crown or have her play hide and seek with the garden fairies. Whatever you do, just have fun, because that's what Birthday's are all about! 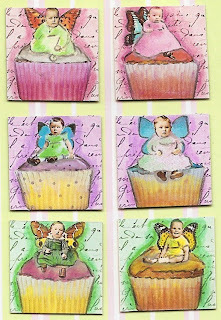 And since we're on the subject of cupcakes, here's a peek at a set of inchies that I made recently for my art group's swap. For those of you who are wondering, my handsome teenage grandson will be 15. As for me . . . A lady never kisses and tells, nor does she reveal her age!!! LOL! But for the record, everyone says that I'm the biggest kid in the family!!! May your weekend be filled with sweet joy! Credits: Collage Sheet - Original image is from the public domain. An original photo of cupcakes was digitally cropped and enhanced with several filters. Stars were punched from scrap paper, scanned and digitally color enhanced. 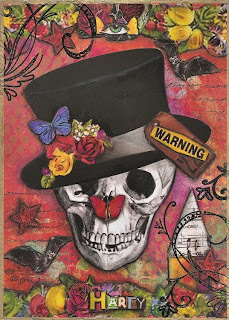 Inchies - Images from Etsy's Lisa's Altered Art. Autumn is my very favorite time of the year. I adore the crisp feel in the air, the smell of smoke filtering through an evening breeze, fall leaves painted with jewel colors and Halloween! Oooooh, how I LOVE Halloween! The decorations, the colors and - most of all - the fun! One of the members in an art group that I belong to came up with the idea of making brass tag pendants for a recent Halloween swap. Each participant received a brass tag, and the only requirements given were to use a Halloween theme and the word "Boo" had to appear somewhere on the tag. Making this wearable art pendant was a lot of fun. Why not try making one to "treat" yourself or someone you know! The techniques that I used are posted below. 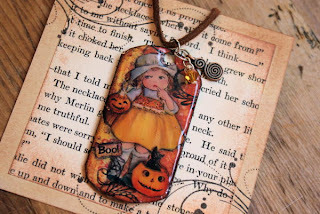 The word, "Boo", was created in a word processing program, printed onto a piece of scrap, cut with deckle-edged scissors and colored with Distress ink. Distress ink was also used to age the edges of the pendant, and flourishes were stamped with black Stazon ink. I also added a hint of orange-colored glitter to the girl's dress for a touch of Halloween sparkle. To finish the pendant, I punched a hole in the top of the brass tag with my Cropadile (worked like a charm - pardon the pun LOL) and applied a layer of Diamond Glaze. I waited 24 hours for the glaze to dry thoroughly and added a jump ring, a jewel and a charm before attaching it to a suede cord. Hope you have a charming day! I learned a valuable lesson this past week: "You cannot force a Muse to cooperate and perform on demand!" I spent several hours in the studio last week trying to create a few pieces for some of my usual challenges; however, it seemed as though my Muse left for a short vacation and took Inspiration with her. I should have put my scissors and glue away, should have taken a walk, should have done laundry. I should have recognized the opportunity for a short artistic "rest". Instead I kept trying to create, and ended with results that were forced and uninspired. Well . . . that's what trash cans are for, arent they?!? So . . . after having a terrible time in the studio, along came the Crowabout images this week, and my Muse was back in a jiffy. She fell in love with the two colorful "tall men", as well as the ballerina. The moral of the story is: "Listen to and always wait for your Muse!" Credits: Almost all of the images are courtesy of Nancy's Baumiller's Flick Crowabout group with the following exceptions. The castle background is from Freubel (thank you Rian! 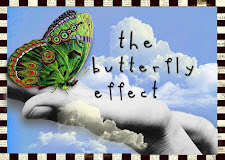 ), the butterflies are from Dover Publications. The stars and Mr. 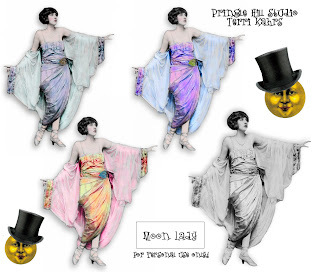 Moon are my creations, and the little snail was clipped from an old brochure, scanned and digitally recolored. 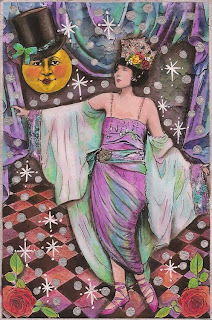 Frenchtown & A Collage Sheet "Freebie"
Thought you might enjoy this collage sheet featuring my "moon lady" (from the Library of Congress); and because you loved Mr. Moon, I've included him too. I didn't embellish his hat, so that you can have some fun with it. 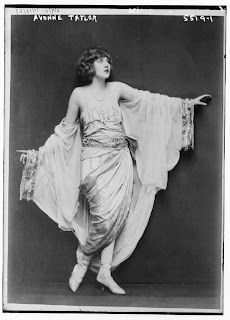 Additionally, I've included the original photo of "moon lady" in it's original state for the purists among us. Just "right click" on your mouse to save both pics as .jpeg files. Although the collage sheet may appear to be a bit "fuzzy" in this post, it really is perfectly clear. Since this is one of my first collage sheets, I'd really appreciate your feedback. Enjoy! 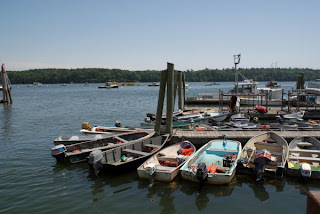 This past holiday weekend my husband and I took a day trip to a Frenchtown, NJ, a small town situated on the banks of the beautiful Delaware River. It's an artsy little town that's been lovingly restored and representative of many small river towns here in the northeastern part of the USA. We had a yummy lunch in a local bistro, gallery hopped and window shopped. Photography is my second artistic passion, and I "clicked" my way through the town. By virtue of my camera, you are cordially invited to take a virtual walk down Main Street with me. Enjoy the sites and surprises! I've never seen licorice this huge! LOL! Yes, this IS a flying piggie! Loved the color in these rubber mats! A Jewel . . .
Found Hiding Around A Corner! Although a bit faded, this mural is still gorgeous! Can you find the kitty in the corner? time to "see" the details! "Dance by the light of the Moon"
Yes, I DID sing "Dance by the Light of the Moon" from "It's a Wonderful Life" when I created this piece for the Three Muses challenge of "moonstruck". After all it IS one of my very favorite movies. So many different images swirled in my mind for this great challenge, it was difficult to choose only one scenario. When I found this picture of the beautiful lady in the Library of Congress archives, I knew I had to use her for this collage. I extracted her digitally from her black and white photo, colorized her (first digitally and then with Prismacolors), and placed a crown (Tammara at Pixel Music) upon her head before placing her in the theater setting (Itkupilli). I chose a moonface (Dover Publications) and added a tophat (Flickr's Artsy-Fartsy Queen) and ribbon (Tammara at Pixel Music). For the romance factor (and because there's moonlight) there just had to be roses (Tammara at Pixel Music). And for the enchantment, I added a touch of glitter to add sparkle to the moon's hatband, the tiara and the trim on the lady's gossamer gown. 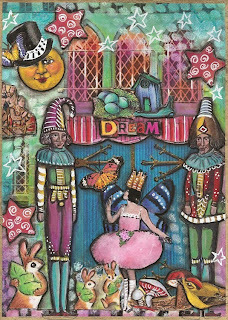 All of the images were enhanced with watercolors and Prismacolor pencils, and the final enchanting elements were added to the background with a white gel pen and a silver metallic marker. Hope you have an enchanting day! I'm not a Goth girl, and I don't deal well with scary things. Matter of fact, the wicked witch in Snow White scares the ever living daylights out of me! When I watch an infrequent scary movie, I'm the girl with her head buried under the blanket. My husband knows that when the weird music begins to play, my hands will start to shake. Then I'll cover my eyes and will give him directions to "Tell me when it's over." You also know how much I adore color - luscious, vivid, decadent color - the brighter, the better. Imagine my initial shock and surprise when I saw this week's Crowabout images for the first time. Haunting, scary, dark and depressing were the first words that came to mind. Thankfully, my hands didn't shake, but the pictures rocked my happy little enchanted world! Using a piece of scrap paper for the background, I added faux text with black Stazon ink and a stenciled pattern using mesh from a fruit box and gold paint. After sizing my images in a photo editing program, they were carefully hand trimmed and pasted into position. Some of the images were outlined with a smudged charcoal pencil, and all of them were color enhanced with watercolors and Prismacolor pencils. Outlines were added carefully with a black Prismacolor pencil and a black Pitt pen. The flourishes were stamped with clear embossing ink and sprinkled with black embossing powder. Further color was added to the background with additional watercolors. Hope you have a day filled with smiles! Credits: Almost all of the images are courtesy of Nancy's Baumiller's Flick Crowabout group with the following exceptions. Both of the butterflies and the rose cluster on Harry's hat are from Dover Publications. Stars are from my collection. The hat is from Tammara at Pixel Music. These images are .png files. There is something very appealing about this little girl all dressed up for her recital. She danced into my heart, and I couldn't resist sharing her with you. I seems as though she's getting ready to dance one of the last joyful dances of summer. 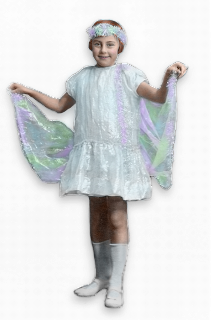 Once again, because I love to have choices and know that you like them too, I've given you both of my enhanced digital images - the black and white as well as the colorized versions. So fairy-fie this little one with wings, have her dance in a meadow or on a stage. Just smile and have some creative fun with her! This is a holiday weekend here in the States. Labor Day has always marked the end of the summer season and the beginning of fall. Children are beginning their school year, the beaches will empty of their summer visitors, and the leaves will soon begin to turn color. Sweater weather will be here soon, along with the smell of smoke wafting in cool breezes and crisp autumnal nights. Whether you're celebrating the Labor Day Holiday or not, enjoy one of the last summer weekends. I hope it will be filled with good friends, a few artful pleasures and relaxation. It's always fun to try something new, and I'm always fascinated with how amazing it is to create something in a digital format. "Chaplin" is the theme at the Three Muses this week, and my entry is totally digital. Although I keep trying to flex my digital "wings", in all honesty I almost didn't post this piece. For some odd reason it just seemed "unfinished" for me; however, the longer I looked at it, the more I liked it! I digitally spray painted several layers of color over a black and white checkered background from Crowabout. After choosing a vintage black and white picture of Chaplin, I played with the threshold settings to create a stencil and cleaned up the edges with the paintbrush tool. Brushes (Deviant Art) created the scrolls. 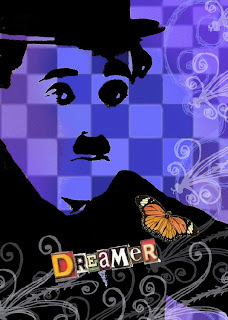 and I added the butterfly (Dover Publications) and the word, "dreamer" (Crowabout). Hope you have a fun-filled day!